In the Chinese capital, Beijing, however, discussion of the topic is muted by comparison. Chinese state media are publishing lengthy articles about how China will stand its ground, with some even arguing it's time for Beijing to teach America a lesson. 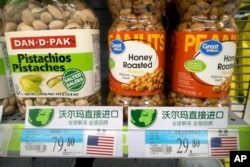 Imported nuts from the United States are displayed at a supermarket in Beijing, March 23, 2018. 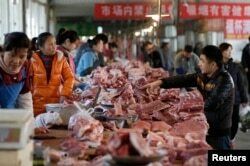 FILE - Meat stalls are seen at a market in Beijing, China, March 25, 2016. Chinese authorities have repeatedly voiced confidence they are prepared to fight to the end if Washington goes ahead with its tariffs, but neither side knows for certain just how broad an impact either country's tariffs could have. 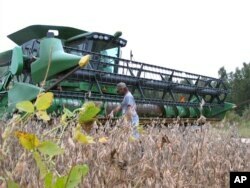 FILE - A farmer checks his combine as he gets ready to harvest his soybean crop at his farm in Turbeville, South Carolina, Oct. 5, 2016.